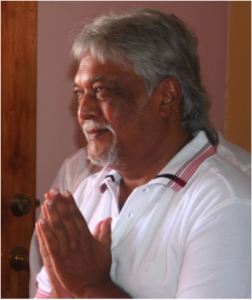 Randolph Forbes Chandrakate, Trinidad: ‘Sri Swamiji looked into my eyes. I felt as though His eyes were piercing the inner me, telling me something & drawing me closer to Him. I can’t explain, but all I knew that I was attracted to Him. That month was very hot and we had not had any rain in Trinidad. However, while the consecration was taking place there was a drizzle and a beautiful halo was seen around the sun at both places; miracles. I am in the process of finding out who am I, but in this world I am called Randolph Chandrakate. I was born in Trinidad in 1946. I have been fortunate to be with Sri Ganapati Sachchidananda Swamiji who I met when I was invited to the first Kriya Yoga course in Trinidad in 1984 where I sat at His Feet for a week. At that time I knew nothing about yoga, religion or anything like that. That evening was a landmark in my life in that I was introduced to a new way of life. In order to make this story meaningful, I must give you some of my background information so you know where I was in life. I was a Marxist-Leninist; a communist. As a young man growing up I was looking for ideals. The ideals of Marxism and Leninism looked good to me at that point in time. I was fired by the imagination of the simple doctrine of the abolition of the exploitation of man by man. I got involved with organizations and people who lived that life. At one point in my life I believed that true justice could only come from the barrel of a gun, and I lived it. If there was exploitation of the poor I was in the middle of that fight; political battles etc. I was involved in the trade unions of the sugar industry. As there werea tremendous amount of suffering in the sugar industry I tried my best to alleviate those situations. We have all come for a colonial background and one has to understand colonialism at is most basic. Living here, in this part of the world, I did not believe that I just came here to go to school, work, get married and die. I did not think that was my purpose in life. I thought that I had to be more than that. Anyway, I went to this Kriya Yoga course not knowing exactly what it was. I remember my first meeting with Sri Swamiji. I was standing against a wall and He was coming down the stairs. I did not know who He was. I had my hands clasped and He came down and stood right in front of me. He said something, but I did not understand what He said. His assistant translated and said “Sri Swamiji says that you must come closer to Him.” I literally went up to Him and bowed. He smiled, walked away and I went back on the wall. The next day the yoga class started. The first thing we did was Ashtanga Yoga and the meaning of it. That had a telling effect on me. I understood the basis of communism and socialism, and here I was doing the concept of Yuma and Ayuma which was telling me the same thing; those were ancient philosophies that were written; how man should live in society with his fellow human beings, and how we should live our own individual personal lives. These ideologies got me fired up again. I took those concepts so seriously that I live them up until today. Somewhere in the middle of the course Sri Swamiji asked all the students that we should come to Him individually. My turn came about the third day of the course, I went to Him and Sri Swamiji looked at me and I looked into His eyes; after that I knew what He meant about coming closer to Him. I felt as though His eyes were piercing the inner me, telling me something and drawing me closer to Him at the same time. I can’t explain what it was, but all I knew that henceforth I was attracted to Him. I went home after the course and continued to have discussions with Dr Dianan Chandool who introduced me to the course. I explained that what I learned there was exactly what I was looking for; that that ideology was so correct. I believe that man should live by some kind of ideology. We should direct our lives about an ideology and have our lives move along that line. Here it was written for us in our books. I started then to work on a program to spread the word of this philosophy and the work of Sri Swamiji. Dr Chandool had given me some literature about who Dattatreya was and others. For the first time I found myself on a different road rather than one that was political and about activism into a more peaceful philosophy. I went to people that I knew that were in this kind of work, like the Seva Sangha. They put me in touch with people like Boloji and Mukunda. My cousin Siewnarine Singh had a radio program about Hindu philosophy and I asked him to use his program to propagate Lord Dattatreya. He agreed so we used to go to the radio station and have discussions about Lord Dattatreya from the little pamphlets, and the word began to spread. In 1986, Sri Swamiji came again and we organized programs in various temples around Trinidad and His mission began to spread. In that year, He went to the California Temple and Princess Town and He had another Kriya Yoga class. His magic began to spread throughout Trinidad. In His previous visit He stayed in Arima, but this time we took Him to visit different parts of the country. In 1988, He came back to visit and stayed at Dr Sieupersad’s and had another Kriya Yoga course. At the last program at the California Temple, in one of His discourses He said that he was tired of going to homes of different people and it was time that He had His own home. I took this seriously. In July, 1988, He did the foundation for the Datta Temple in Carapichima and fourteen days later, before He left, that temple was completed and inaugurated. This was the catalyst for the start of another building. When I look back at that rice fields that we had to fill in, I am often surprised as we are ordinary human beings with limited resources. We knew what we wanted and knew what Sri Swamiji wanted, and we went ahead and did it. People from all walks of life came and donated time and money. In March, 1990, we had the consecration of Sri Swamiji’s residence on the same compound. This was the same time that the Aripo Temple was being consecrated. That month was very hot and we had not had any rain in Trinidad. However, while the consecration was taking place there was a drizzle and a beautiful halo was seen around the sun at both places; miracles. Those were some of the beginning experiences that I had with Sri Swamiji. I have been the secretary of the organization for about ten years and through this position I have seen some of His direct teachings. When I look back at my life I see that my ideology has not changed, but just gone in a more positive direction. I still frown upon the exploitation of man by man. Swamiji has taught me to understand my development, who am I? I know that he has sent me here to serve my purpose. One has to be very intuitive and vigilant with Sri Swamiji. 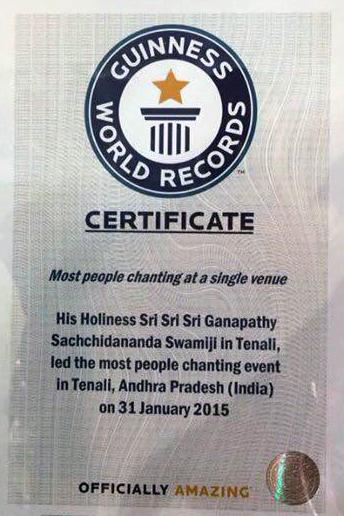 One thing I follow very closely is the Bhakti Mala and here you can see what Sri Swamiji has done especially in India. You can see the transformation of villages and it is because of Him; it is not just about civilization though. He is not like Ravan who gave his people a civilization but no culture. Sri Swamiji gives His people culture and He is doing this, but also letting us know how to live. For some of us it is slow, but it will come. His music has transformed Trinidad. I remember there was an incident where there was a controversy about steel pan music being introduced in schools. People were saying that they wanted more traditional Indian instruments as steel pan was not good for our culture. Sri Swamiji introduced steel pan in the Dattatreya Yoga Center and that was the end of the controversy in Trinidad. It’s a subtle gradual transformation of including culture with our civilization. He continues to train us by teaching us. Students of Kriya yoga should be a bit more developed. Yoga is not just pranayam, but it is a total experience. By cleansing ourselves only then can we accommodate the knowledge of the soul; if we cannot purify ourselves then we cannot accept the knowledge. In 1995, when we had the Yagna, I had received a letter that I had to do jury service, but it was during the time of Sri Swamiji’s visit. I wrote a letter to the judge to explain that my spiritual master will be in Trinidad to do an important ‘Yagna for World Peace’ and I would like to be exempted for that period. On the day of the hearing I went to the judge’s chambers to make my petition to be excused. There were other people there and as I waited my turn I started to focus on Swamiji. While I was there I saw a vision of Sri Swamiji and started to talk with Him, but I did not take it very seriously. Suddenly the vision gave me a wink of the eye as it was my turn. The judge read my letter and said okay, you are exempt for life, and then I realized that the vision was real. However, this was not my only vision of Him. There have been times that He would appear and smile. When you get that kind of darshan from Sri Swamiji, you begin to understand that the physical Swamiji, the flesh and body, is not the real Swamiji. While I am speaking here, I know that He is here. There isn’t a moment that goes by that I do not feel Sri Swamiji’s presence around. Anybody, by developing their yoga can communicate with Sri Swamiji on a one to one basis. In 1995 there were lines of people to see Him. He called me and asked who all these people were. I had to explain to Him that they had come to see Him. He said, “That is a lesson for you. One day Sri Swamiji will not be present in the body, you have to learn the power of the dristi; speak to me, meditate on me and I will come.” In the early years He spoke of His five pillars; faith, discipline, devotion, viragya and gyana; these have guided my life. If I did not have the faith in Sri Swamiji’s teachings I would have left. What I saw in the Bhakti Mala and in the various village levels in India, I knew thatI was right with Sri Swamiji. The cornerstone of the teaching of Sri Swamiji is faith. We talk about devotion and surrender; these are not events, they are a process. He did not stop there with me. All the institutions that I thought I had created, companies that had been formed and buildings that were built, He broke them up. It shows that all these things are not permanent and the only thing permanent is the principles. He is the principles; the only permanence that there is, is Him; that is the only thing that remains. In 1987, one exercise that was given to us in Switzerland was Sri Swamiji telling us to listen carefully for a sound and to record that sound. I heard a gunshot that no one else heard. Other people heard other things, but I heard this because of my inner psyche at that time. There are these different events that have affected me. Another time I was traveling throughout Trinidad with Him and at this time there were conflicts in South Africa and Palestine. I asked Sri Swamiji when He thought these conflicts would be over. He said South Africa will be over soon, but Palestine would take a little while. As it happened, a few years afterwards South Africa ended their conflict, but Palestine is still struggling. Also in that year, Sri Swamiji said that in the far distant past a saint “Agastya” used to go to Aripo. In subsequent conversations He said that He used to go to Aripo. I deduced that Agastya and Sri Swamiji were one and the same. In those conversations with Him, if you reflect on them you could see their meaning. In the history of Trinidad there was a great Yagna that used to take place; no one knows the exact location, but we know that it was up in the northern hills. I suspect that it was at Aripo. Also when you look at the history you see that this is a strange island. In the northernmost part of the Caribbean there is a Havana (Havan) and in the southernmost part there is Moruga (Lord Moruga). There were Amerindians that lived here and maybe they knew about Moruga and named the place as such in honor of Lord Moruga. The names that they have, where did they come from? The similarities in culture are astounding for places that are so far apart. They too even worshipped the sun. Trinidad itself is a blessed place, which is why He keeps coming back. Aripo has a unique history with the Amerindians, but I have not figured out what it is exactly. The Amerindians used to move from the mainland to the islands and Moruga was one of their main landing points. There are ancient artifacts that were found there. Also when the East Indians came to settle, a lot of them were Sadhus and where they settled it was called Sadhua. Now there is a temple there, even thought the name has changed. Things have a mysterious way, of energy working and coming back to fulfill its purpose. Sri Swamiji first came to Trinidad in 1976. This was an important year for Trinidad as we became a Republic that year. He came back in 1981 and this was a pivotal year for Trinidad with its politics. In 1986, He came again there was another political change and we had a different political party in charge. In 1988, there were dynamic events with the politics again. In 1990, there was an insurrection where the country was overthrown. Sri Swamiji was in Switzerland when this took place and He sent messages to us. One of them was this analogy which was appropriate as we had just celebrated Ram Navami with great festivities. “There was joy and happiness when Ram was married, there werefestivities and everyone was happy. All the great sages were there and a few days laterr there was crying and sadness as Lord Rama had to go into the forest for exile.” He said that we should not worry as He would pray for us. In three days Yaseen Abu Bakar, head of the Muslim insurgence, gave up his guns. Later that year He came to Trinidad and went into the Parliament. In 1995, we had the yagna and there was change when we got a new political party forming the government. In 2000, Sri Swamiji came and we had a shift in politics again. In 2006, all the opposition forces came to the Dattatreya Yoga Center and He told them that they all had to have unity or there would be chaos. Whenever Sri Swamiji comes to Trinidad, all the politicians will come. They know His influence. There are unforeseen things, but if you are vigilant and look you can see the importance. In 1995, at the Yagna for world peace, He said that there are things that are happening outside of this universe that we would not have any answers for them. Then we heard that an asteroid had hit Jupiter and dented the planet, but we did not know what the effect of this was. However, we see that as He says, so it happens. Jaya Guru Datta! Thanks Randolph, for sharing your experiences with our Sri Swamiji. It has been years of great association and it really reflects in the way your experiences are written. Your writings have a profound influence on me when you say that we all have to live for a greater idea than mere existence. Its very true that he alone is permanent. Its so true when you say he is there with you, he is there for everyone of us in a way and form we need and accept. Thanks for recounting the 5 principles of faith, discipline, devotion, vairagya and gyana. I feel its a time well spent when I read about your experiences. We are so blessed that we can serve in whatever little way we can. Thankyou! Sri Guru Datta. Jaya guru datta! It is fortunate that we could witness a fully transformed deep bhakti episode of true devotees of Pujya sadgurudev. blessed every one . This testimonial of the life journey, introspection and honesty of an individual who tried to put meanings and understanding to his personal experiences is very inspiring. Principles and how we can use Swamiji tools to enrich our life and those of others.